Today’s post is part of my homework for my nutrition class. Disclaimer: the calories are from different sources online, they are not accurate, just guesstimating the total amount. The assignment was to write down meals you would normally have and what would be a better choice. This was a powerful exercise because these are real choices I used to make. After this exercise I realize I might not go to a Chinese restaurant as often. I don’t think that 548 calories are worth 7 dollars if I can make healthier choices. I thought I was doing good in the coffee shop but now I know better. The most shocking comparison for me was Arby’s. When my husband and I were dining there often we wondered why I couldn’t lose the weight. Now I know why: 1,310 calories!!! Thank God for knowledge and the ability to make good choices. 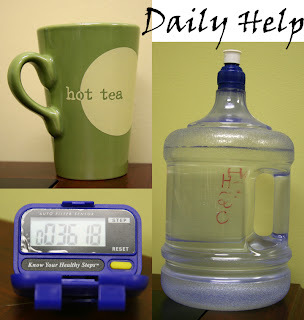 The picture is showing the choices I’ve been making daily: green tea, water and the pedometer which represents walking. The most important daily choice I make is to have a relationship with God. Without that I couldn’t do anything.